Meridian Bank’s journey to the trading floor took strategic growth, careful planning and 55 presentations in six days. Successfully launching a Wall Street IPO is a fantasy of many an entrepreneur. Chris Annas, founder and CEO of $945 million-asset Meridian Bank in Malvern, Pa., lived that fantasy last fall. 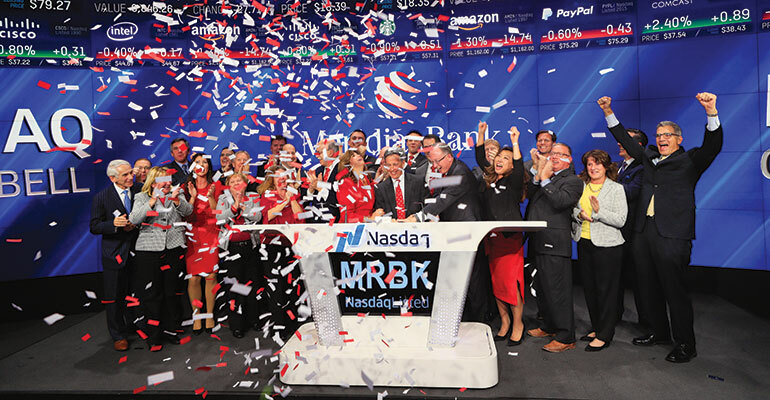 That exciting day, which took place about three weeks after trading began for Meridian Bank (Nasdaq: MRBK), marked a new era for the institution. But it was preceded by years of planning and work by Annas and his team. Annas founded Meridian Bank in 2004 after 25 years working at other banks. He helped launch Community Bank of Chester County in 1998, and served as that bank’s CEO until an M&A wave among independent banks in the Delaware Valley persuaded him that it was time to launch his own bank. Meridian Bank focused on commercial and institutional (C&I) customers, ranging from small businesses with $500,000 in annual revenue to medium-size firms bringing in $100 million. Meridian was the first community bank in the Delaware Valley to offer check-scanner technology. It was popular with customers who didn’t want to run to the bank every day, and it allowed Meridian to focus less on opening branches. “We had just two branches, and waited until we had $600 million in deposits before we opened a third branch,” Annas says. A turning point arrived in 2010, when nearby Harleysville Bank was acquired and the new owner moved mortgage operations to Buffalo, N.Y. Many of the mortgage bankers from Harleysville did not want to relocate, so Annas hired 60 of them and formed a fully operational mortgage company within six months. The company wrote $910 million in mortgages in 2016. 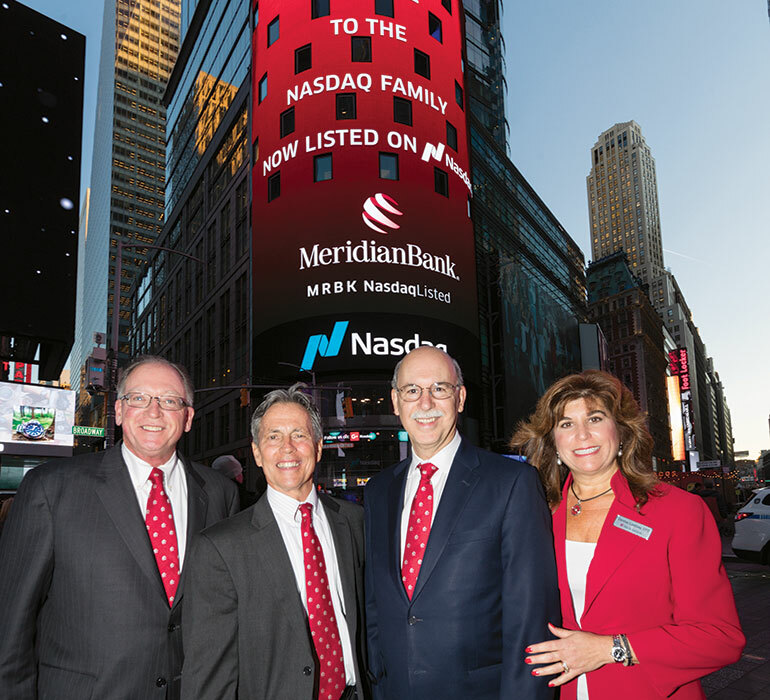 Following 55 road show presentations in six days, Meridian Bank’s Charlie Kochka, Chris Annas, Joe Cafarchio and Denise Lindsay celebrate the launch of their IPO in New York City. When BB&T Bank acquired Susquehanna Bank and National Penn Bank in 2016, Meridian hired a dozen of those banks’ lending officers. It proceeded to add three more branches, strategically located to give it a presence in each county in the Delaware Valley. By late 2016, Annas felt the time was right to go public. Meridian’s new branches and employees were settling in, the regulatory environment was easing, and investors were seeking new opportunities. The bankers at Sandler O’Neill were essential to Meridian’s IPO. For example, they created models to forecast the multiples Meridian might expect. But Annas also tapped internal expertise, primarily that of his CFO, Denise Lindsay. The next step in the process was a “road show” to persuade investors to buy the IPO’s shares. The crew returned to New York for a few more presentations on Monday. Trading began the next day—Nov. 7, 2017—at 10:15 a.m. Annas and his colleagues were able to stand on the Nasdaq trading floor in Sandler O’Neill’s position when the big moment arrived. “That was really cool for us,” Annas says. Meridian’s shares were priced at $17, and the IPO raised $46 million for the bank. The stock price jumped briefly to more than $20 but has hovered in the $18 range for most of 2018. Annas says he expects that, within about 18 months, the bank will be back looking for more capital. Life post-IPO involves more time spent with investors and a sharper focus on quarterly report cards. But Annas says he feels the IPO has strengthened the community bank’s position overall. Ed Avis is a writer in Illinois.